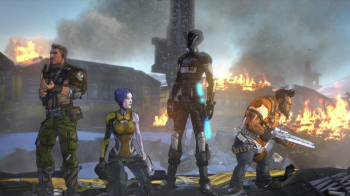 Players who bought the Russian version of Borderlands 2 from Steam can only play against players with the same version. So, Borderlands 2 just came out and the first reviews are trickling in. The initial response to the game has been positive and there's been no glaring technical screw-ups thus far, so everyone is happy, right? Wrong. The Russians aren't happy. Neither are players in the Ukraine, Lithuania, Latvia and Estonia. It turns that anyone with a Russian IP address who buys the game from Steam is given, unsurprisingly, a Russian version of the game. The thing is, the Russian version of the game is notably inferior to those of other regions, and users in the aforementioned Commonwealth countries are often assigned Russian IP addresses. The main problem is that the Russian version's multiplayer is region-locked. Gearbox has confirmed that players with the RU version of BL2 will only be allowed to play with those with the same version of the game. Some RU players are reporting they can't activate their Season Passes, giving rise to speculation that their copies of the game may not be compatible with the upcoming DLC. There's also some concern that the RU version of the game won't support multiple languages. Most users outside of Russia don't - surprise surprise - speak Russian. Players with Russian IP addresses paid full price for the game, and the region-locking wasn't mentioned in the pre-sale and pre-order information on Steam. Boxed copies of the game appear to be unaffected, despite the fact they still require Steam. Publisher, 2K, has since confirmed that the game is region-locked and apologized for the "incorrect information" on the title's Steam page. The company is currently setting up a system to allow customers who pre-purchased or pre-ordered the game to obtain refunds. It also promises to look into adding support for additional languages, but adds that they won't be available during the game's launch window.